Additional Information New old stock condition with box & papers! 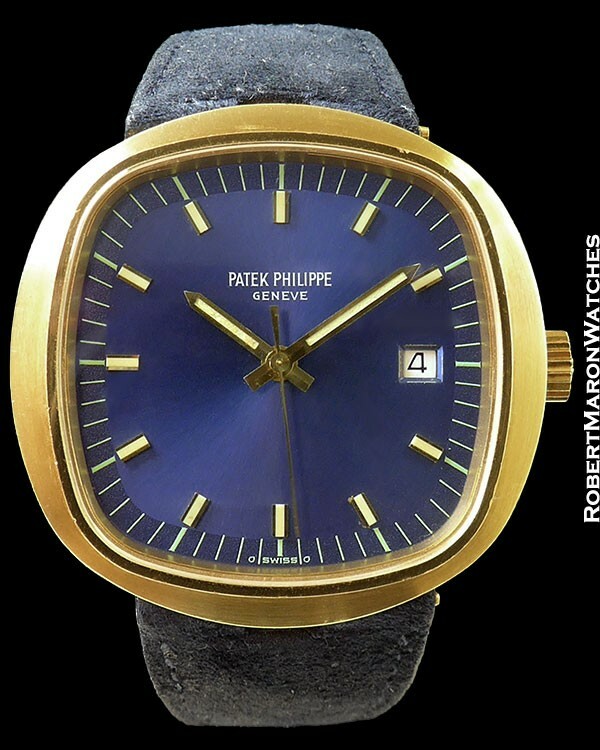 The Patek Philippe Beta 21 movement was the fruit of a collaborative effort spanning from 1962 through 1969, which was sponsored by over 20 leading Swiss watch brands, and named the Centre Electronique Horloger. The resulting movement was introduced at the 1970 Basel Fair, and was put into watches by various brands over the proceeding years. The Patek Philippe Beta 21 (any Beta 21 watch really) is rare. 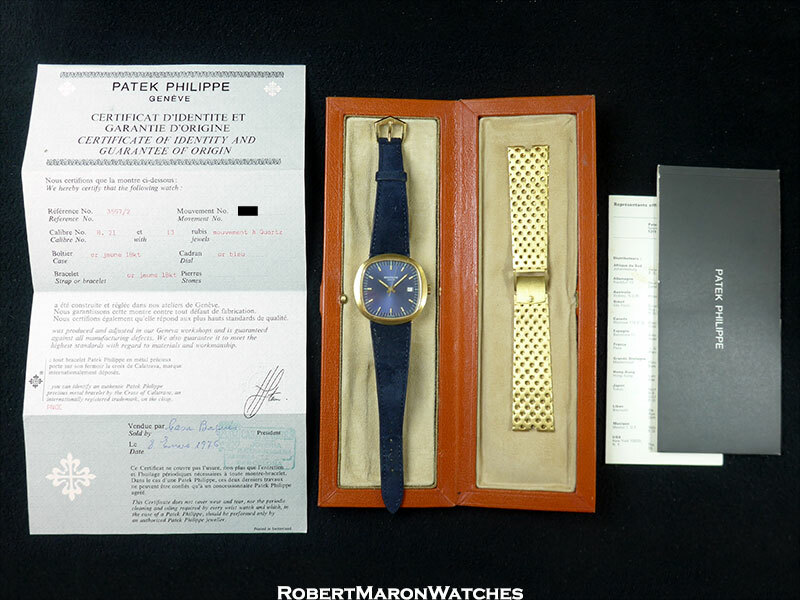 A New Old Stock Patek 3597/2 with removable bracelet and original box and papers is unheard of! The Beta 21 is really more an electronic caliber, but be that as it may, the movement features a quartz crystal and interestingly, the natural oscillation rate of the quartz crystal is 8192 Hz, which Patek reduced to 256 Hz by means of a proprietary frequency reducer. The seconds hand sweeps (versus the usual ticking of quartz movements), and the caliber has 13 jewels. A date is provided at the 3 o’clock position. As historic as this timepiece is, it’s got a heck of a lot of 70’s funky chunkiness going on too. 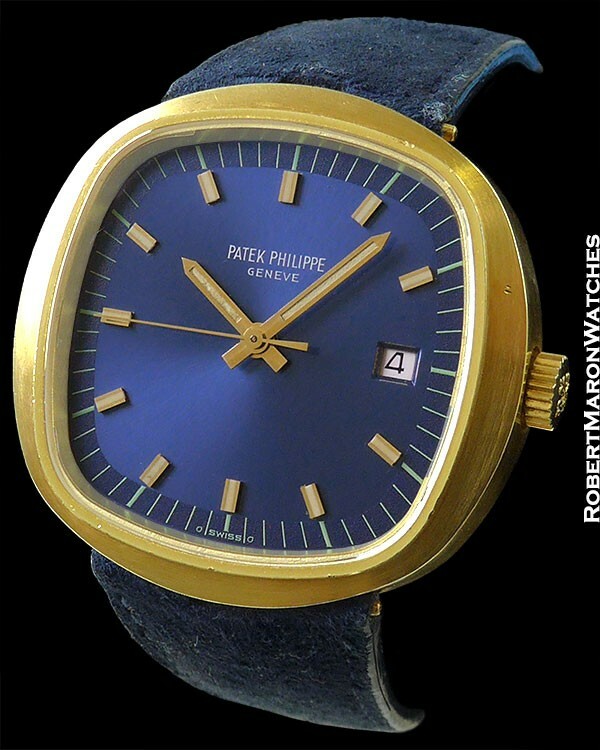 Collecting Patek Philippe watches can be a serious endeavor. These oversized gold behemoth Betas helps enormously with the fun quotient in your collection. Indeed, this solid 18k gold case measures 42mm wide and long by 12.5mm thick. The crystal is sapphire. 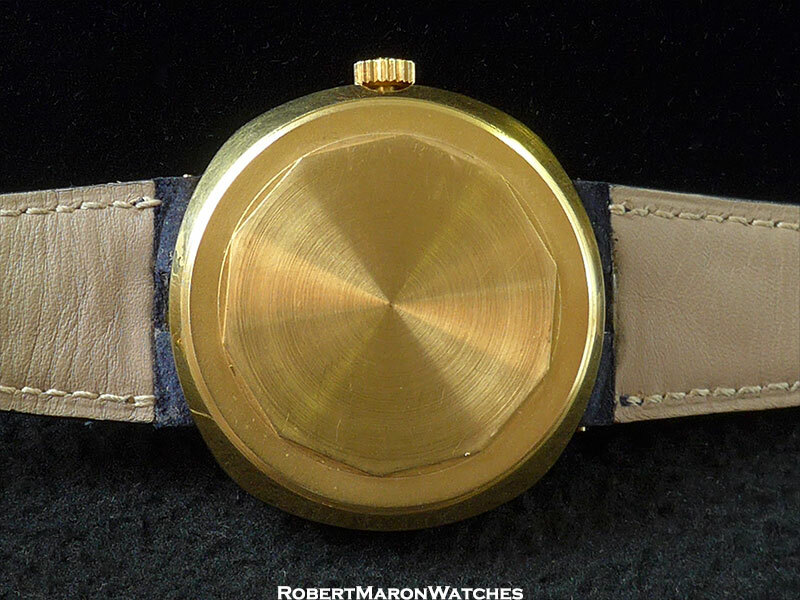 There is a tiny band of mirror finished gold around the crystal which steps down to a broad brush finished bezel. The case sides are also brush finished. There is a mirrored surface on the underside of the main case body and the massive 18k screw back is matte finished. The big story with this particular case, which makes this watch a rarity amongst Betas, is the removable bracelet system. In other words, you can put on the original 18k Patek bracelet or a strap. Most Beta cases have an integral bracelet (no lugs, the bracelet is welded to the case) or lugs (which preclude wearing it on a bracelet). This is rare, rare, rare! Original blue Sigma dial with a radial brushed finish, applied golden hour markers, minutes chapter and date. Hour markers and hands are inlaid with luminous. At the periphery of the dial, there is an area that has a pebbled texture which contains the minutes/seconds chapter. Dial is in perfect condition. This watch will be delivered on blue strap with 18k Patek tang buckle along with its original 18k gold Patek Philippe space age style perforated and satin finished bracelet. Bracelet and case are in new old stock condition, and the watch is running great. This watch has a lot going on, and is highly collectable and highly fun.